The multi-level curved façades of these residencies take inspiration from rock formations – playing with geometry, colours and materials. 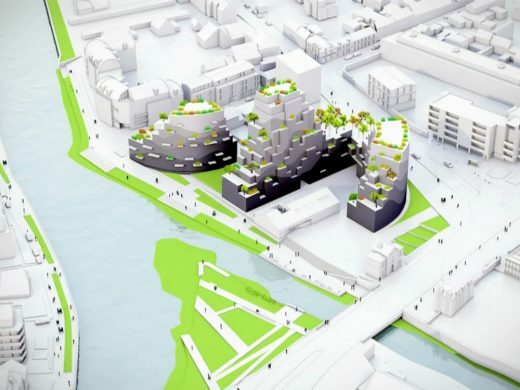 The project will contribute to the transformation of Greater Rennes, with the ambition of creating a socially cohesive and welcoming riverside community. 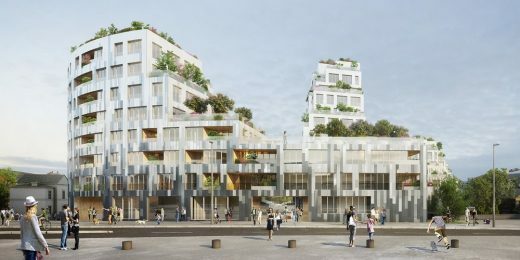 The city of Rennes, led by Mayor Nathalie Appéré announced today that the team of MVRDV, ALL and Giboire won the competition for the project Ilot de l’Octroi. 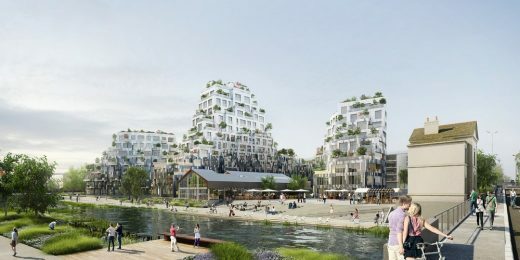 This new residential development is part of the Rennes 2030 urban project and will transform Octroi into a green union between existing paths along the Ille et Vilaine rivers and the centre of the city. Rennes Métropole is among the most attractive areas to live in France. Its diversity of heritage and growth led to a shift in emphasis from the centre to the city’s outer areas connected by the pedestrianised Mail François Mitterrand. This move from a rural to urban context has meant denser developments occurring at the edges, to prevent encroachment onto the countryside. The growth in population and industry has called for measures to cope with future change, most notably for more housing and efficient transport routes. 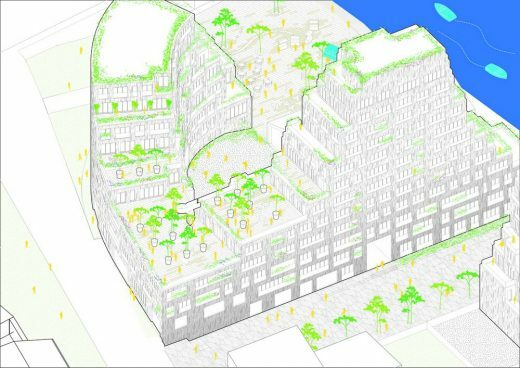 MVRDV, ALL and Giboire respond to this need for more sustainable housing communities and will contribute to the expansion of the centre by breathing new life and refocusing communities along the rivers. 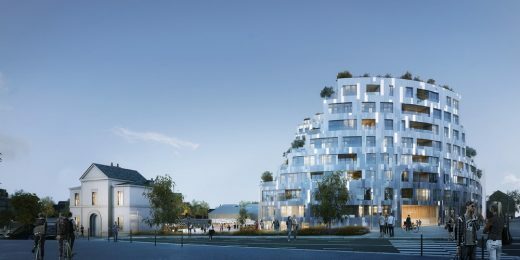 This 8,200m2 complex will consist of 135 dwellings, a mix of private residences and a third offered as social housing. All of the apartments have outdoor spaces with balconies facing the waterfront, loggias and terraces. They are also positioned on split levels so no view is directly opposite. Trees and greenery from the public square connect upwards to the green rooftops following the façades. The building’s distinct curved façades, slope from river level to the roofs allowing for views of the city. At night, the top part of the buildings light up and provide a new night silhouette for the confluence. The curved typology makes the roof top garden on the second floor inviting and accessible for residents, where a workshop and diverse botanical garden will also be located. The exterior façade’s distinct grey colour is made from three different textures, and gradations in its colouring resemble rock formations found in a natural landscape. To accentuate the façade, the movement and support flow curves off the frame and opens on the external façades, giving the building extra height. The interior façades, on the other hand, are cut to offer as many terraces as possible. The vertical openings amplify the developing height making the building stand out from a distance. The design idea was to create more cohesion with defined volume instead of individual and smaller units. The building’s distinct identity is in-keeping with the surrounding area’s landscape and at the heart of this development, a public square extending through steps along the riverbanks and creating a buzzing area for dining, socialising and taking in views of the adjacent floating garden, Jardin de Confluence. 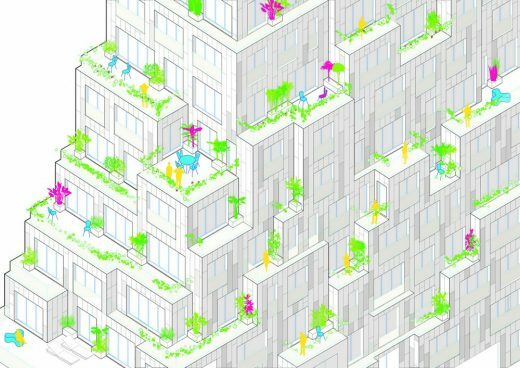 The development project of Ilot de l’Octroi saw five teams of internationally renowned architects; Aires Mateus, LIN, MVRDV, Vergely and Zucchi all compete, with the team led by MVRDV-ALL-Giboire selected for their winning design. The construction will start at the beginning of 2018 en will be finished in 2020.